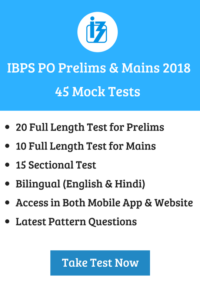 IBPS PO Prelims exam is the gate pass to the IBPS PO Tier-II examination. The fantasy of banking jobs among the individuals resulted in the toughness of the selection process. The preliminary exam came into process in the year of 2015, until then there were no preliminary examination. The preliminary exam picks the prominent candidates to the second stage; this exam is also the toughest one. But the aspirants can easily crack the preliminary exam with the dedicated preparation methodologies. You also should know topic which scores you with less consumption of time out of the three sections. Candidates should clear this phase in order to qualify for the Mains exam. Bank aspirants can crack this phase if prepared with good plan strategies, hard work and dedication. There are three sections in this exam that are Quantitative Aptitude, Reasoning and English Language. There are 35 questions each in Quantitative Aptitude and Reasoning section and English section consists of 30 questions. Each section has timing of 20 minutes to answer all the questions. Each correct answer will be awarded 1 mark. The negative marking for each wrong answer is 0.25. Practice makes a man perfect, so practice to achieve your goal. Crack the exam with speed, accuracy and time-management and land up in your dream job.